17 July 2015. 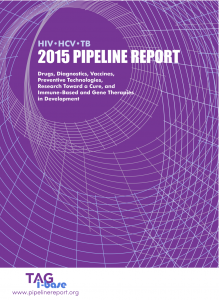 Related: Pipeline report, Cure research. The most significant development has been a disappointment: the child once known as the Mississippi baby, considered possibly cured of HIV infection, experienced a viral-load rebound and had to restart antiretroviral therapy (ART). The news was announced July 10, 2014,  and a case report published in the New England Journal of Medicine in February of this year. ART had been initiated shortly after the child’s birth and then interrupted around 18 months later; the child subsequently went 27 months with no detectable viral load or replication-competent HIV before the rebound occurred. An International Maternal Pediatric Adolescent AIDS Clinical Trials (IMPAACT) Network trial based on the case, P1115, has gone ahead and will attempt to evaluate whether similar or longer periods of remission can be obtained by immediate treatment of newborns infected with HIV because their mothers did not receive appropriate prevention of mother-to-child transmission. After the return of viral load in the Mississippi child, some leading researchers – including Nobel laureate Françoise Barré-Sinoussi – are advocating more cautious application of the word cure and the term functional cure (which has never been particularly well defined) and recommending the use of remission instead. The concept is intended to refer to the ability to safely interrupt ART for some period; however, various different forms of ART-free remission have been described, and precise criteria have yet to be proposed. A related thread of research is attempting to identify biomarkers that predict a delay in viral load rebound after ART interruption, which would allow candidate therapeutic approaches to be assessed without necessarily requiring study participants to stop treatment. A number of retrospective analyses presented or published over the past year have reported that levels of HIV DNA showed significant associations with time to viral-load rebound  or viral-load set point  in past clinical trials involving ART interruption. A forthcoming AIDS Clinical Trials Group (ACTG) study (ACTG A5345) plans to prospectively assess whether HIV reservoir measurements can predict the pace of viral-load recrudescence during a carefully monitored break from ART. The research group of Ole Søgaard at the University of Aarhus in Denmark continues to pioneer the study of candidate latency-reversing agents in humans. These compounds aim to activate the dormant HIV in latently infected memory CD4+ T cells, which constitute the major reservoir of virus in individuals on ART. Results from a clinical trial of the HDAC inhibitor panobinostat in HIV-positive individuals showed significant induction of HIV RNA expression,  and a genetic analysis by Sarah Palmer indicates that the drug activated a diverse pool of latent viruses. Consistent with previously published laboratory research,  induction of HIV RNA expression did not lead to a measurable depletion of the HIV reservoir overall. Four out of the 15 trial participants experienced a persistent decline in HIV DNA levels, ranging from 67% to 84%, and this correlated with a slightly longer time to viral-load rebound during an analytical ART interruption. An analysis presented as a poster by Martin Tolstrup at the 2014 International AIDS Conference suggested that this outcome may have been linked to innate immunity – particularly enhanced natural killer cell activity  – but due to the small subset of participants involved the results can be viewed only as exploratory. Also at the 2014 International AIDS Conference, Søgaard presented preliminary results from an ongoing trial of the HDAC inhibitor romidepsin  (also currently under study at the ACTG). The results demonstrated induction of HIV RNA to levels detectable using a clinical viral-load test (>20 copies/mL and up to a little over 100 copies/mL in some cases), which has not been documented with any other latency-reversing agent to date. As in other HDAC inhibitor trials, no overall change in HIV DNA or other reservoir measures was observed. Other combinations of HDAC inhibitors and therapeutic HIV vaccines are also being explored in trials. Researchers at CARE plan to marry the HDAC inhibitor vorinostat with AGS-004, a dendritic cell-based vaccine that incorporates HIV antigens derived from viral RNA sampled from the intended recipient. In the United Kingdom, the Research In Viral Eradication of HIV Reservoirs (RIVER) trial aims to evaluate an HDAC inhibitor along with chimpanzee adenovirus and modified vaccinia Ankara strain (MVA) vaccine vectors encoding HIV antigens selected based on their conservation among diverse viruses. The drug disulfiram, better known by its trade name, Antabuse, is approved by the U.S. Food and Drug Administration (FDA) for the treatment of alcoholism. The potential HIV latency-reversing activity of disulfiram was first identified in a laboratory screen conducted by Robert Siliciano’s research group at Johns Hopkins,  and a small pilot study was later conducted at the University of California, San Francisco (UCSF). Data from a larger dose-escalation trial recently presented by Steven Deeks of UCSF revealed significant increases in levels of cell-associated HIV RNA, along with a postadministration increase in plasma HIV RNA of around twofold in recipients of the highest dose, 2,000 mg/day. Although there has been some variability in the results, there is interest in continuing to study disulfiram’s latency-reversing potential due to its extensive safety record. Two widely publicized presentations at the 2015 Conference on Retroviruses and Opportunistic Infections describe the latency-reversing capacity of GS-9620, a TLR-7 agonist developed by Gilead Sciences. In a study in SIV-infected macaques on ART, GS-9620 caused transient viral-load increases to detectable levels at the highest dose administered. Evidence of increased natural killer cell and CD8+ T-cell activation was also seen, and levels of HIV DNA declined significantly in three of four animals, in both blood and tissues. A separate poster presentation reported that GS-9620 activated latent HIV in CD4+ T cells isolated from HIV-positive individuals on ART. Clinical trials in hepatitis B and C have found GS-9620 to be safe, [58, 59] and a phase I exploration of safety and activity in HIV-positive individuals is under way (regrettably, Gilead Sciences has not registered the trial at clinicaltrials.gov). Agents that may have a dual mechanism of action – both reversing HIV latency and enhancing immune responses with the potential to eliminate virus-infected cells – have emerged as a theme this year. Among them is the cytokine IL-15, which has been shown to induce HIV production by latently infected CD4+ T cells  and promote natural killer cell and CD8+ T-cell activity. ALT-803, also known as an IL-15 superagonist, is a modified version of the cytokine with enhanced potency. Recent studies of ALT-803 indicate that it can activate natural killer cells, leading to inhibition of HIV in humanized mice. In laboratory experiments, ALT-803 was found to both stimulate expression of HIV antigens by latently infected CD4+ T cells and enhance their killing by HIV-specific CD8+ T cells. A pilot study of ALT-803 in HIV-positive individuals on ART is due to start soon at the University of Minnesota. Another PKC agonist drawing interest is Ingenol-B, an extract from the sap of the tropical shrub Euphorbia tirucalli. Several research laboratories have reported that it has latency-reversing activity, [71, 72, 73] and there is evidence to suggest that it may be less prone to cause toxicity than other PKC agonists. Clinical trials are in the planning stages. New technologies have facilitated the discovery of an increasing number of antibodies capable of broadly neutralizing a diverse array of HIV isolates from across the globe, many with great potency (robust inhibition of HIV is achieved at relatively low antibody concentrations). [74, 75, 76] Tens of thousands of HIV-specific B cells can now be sampled from HIV-positive individuals and the antibodies they are producing fished from each individual cell and tested for their ability to inhibit viral replication. The broadly neutralizing antibodies (bNAbs) identified with this approach do not necessarily benefit the person they are sampled from, likely due in part to the complex swarm of diverse HIV variants circulating in chronically infected individuals, and the titers of the bNAbs being low compared to the amount of virus present. But the potency and breadth of neutralization of the new generation of bNAbs suggest that they could be beneficial when delivered intravenously or subcutaneously in both preventive and therapeutic contexts (Preventive Technologies). Several potent bNAbs are now being manufactured and tested in clinical trials, and this year saw the publication of results from a phase I evaluation of the bNAb 3BNC117 in HIV-positive individuals. At the highest of the four doses administered (30 mg/kg), a single intravenous infusion of 3BNC117 led to a decline in viral load ranging from 0.8 to 2.5 logs, with four of eight recipients remaining below baseline at the last reported follow-up (day 56 postinfusion). There was evidence of 3BNC117-resistant HIV emerging in some participants, and one individual showed high-level resistance to the antibody at baseline. The investigators are currently analyzing whether any recipients developed immune responses against the 3BNC117 antibody; those results are pending. The confirmation that bNAbs are active against HIV in humans presages a significant expansion of research in this area. VRC01, a bNAb developed by the NIH Vaccine Research Center (VRC), is already undergoing testing (delivered intravenously or subcutaneously)  in both HIV-positive and HIV-negative individuals, and several new clinical trials are imminent; these include an assessment of effects on the HIV reservoir and on viral-load rebound after ART interruption. The U.S. Military HIV Research Program will soon launch a study of VRC01 in Thai individuals with acute HIV infection. The VRC has begun manufacture of a longer-acting formulation of VRC01 (VRC01-LS) and an additional long-acting bNAb, VRC07-523-LS. An alternative approach to therapeutically exploiting immune responses against HIV is to administer CD8+ T cells targeting the virus. The CD8+ T cells are extracted from the intended recipient, stimulated with HIV antigens and expanded in the laboratory, and then reinfused. David Margolis and colleagues from CARE and the University of North Carolina at Chapel Hill are pursuing this strategy – which they have named HIV-1 Antigen Expanded Specific T Cell Therapy (HXTC)  – as a means to target the HIV reservoir, and an initial phase I trial investigating safety and efficacy has begun. In laboratory studies, HIV-specific CD8+ T cells generated by their method were able to kill latently infected CD4+ T cells exposed to the latency-reversing HDAC inhibitor vorinostat. Infusions of autologous HIV-specific CD8+ T cells are also being studied in an ongoing trial led by Yong-Tao Sun of the Tangdu Hospital, Fourth Military Medical University in Xi’an, China. Drugs that inhibit the cellular protein mTOR are under investigation in two trials. The effects of mTOR inhibitors are complex, involving both immune-suppressive and immune-enhancing activity. In a retrospective study of HIV-positive individuals who had undergone kidney transplantation, receipt of the mTOR inhibitor sirolimus was associated with significantly reduced levels of HIV DNA. The ACTG is soon to launch a pilot study to prospectively measure the impact of the drug on the HIV reservoir. Research continues into the use of the Sangamo BioSciences technology to genetically modify CD4+ T cells ex vivo. The CD4+ T cells are extracted from HIV-positive individuals, exposed to the zinc finger nuclease to disrupt the CCR5 gene, then expanded and reinfused. In studies published and presented to date, [94, 95] an adenovirus vector was used to deliver the zinc finger nuclease into the CD4+ T cells during the process. The company is now testing a different and potentially more efficient approach in which messenger RNA encoding the zinc finger nuclease is used instead of an adenovirus vector. Over the past year, two clinical trials have opened that will deliver CD4+ T cells modified with this method; both are using transient administration of cyclophosphamide prior to the infusion to enhance the engraftment of the altered cells. Recent published results include those from a completed trial of Barbara Ensoli’s HIV Tat protein vaccine, which has been the subject of some controversy over the years, with questions having been raised about the appropriateness of Italian government funding for the research. Ensoli and colleagues’ paper, published in the open-access journal Retrovirology, reports that the vaccine induced Tat-specific antibody responses and that recipients showed a lowering of HIV DNA levels. However, the trial did not include a placebo control group; instead, comparisons were made with a separate parallel cohort, and this makes the data difficult to interpret. Results from a randomized clinical trial conducted in South Africa are pending. Another relatively unconventional therapy is Tripterygium wilfordii Hook F, an extract from a vine used in traditional Chinese medicine. A paper published earlier this year reported that administration to INRs in a small pilot study was associated with an increase in CD4+ T-cell counts;  a larger randomized trial that aims to enroll 60 people is under way. An extract of Tripterygium wilfordii is also being studied in China for its effects on the HIV reservoir (see table 1). Luzuriaga K, Gay H, Ziemniak C, et al. Viremic relapse after HIV-1 remission in a perinatally infected child. N Engl J Med. 2015 Feb 19;372(8):786-8. doi: 10.1056/NEJMc1413931. Hütter G. More on shift of HIV tropism in stem-cell transplantation with CCR5 delta32/delta32 mutation. N Engl J Med. 2014 Dec 18;371(25):2437-8. doi: 10.1056/NEJMc1412279. Duarte RF, Salgado M, Sánchez-Ortega I, et al. CCR5 Δ32 homozygous cord blood allogeneic transplantation in a patient with HIV: a case report. Lancet HIV. 2015 June 1;2(6):e236-e242. doi:10.1016/S2352-3018(15)00083-1. Henrich TJ. HIV eradication: is cord blood the answer? Lancet HIV. 2015 June 1;2(6):e219-e220. doi:10.1016/S2352-3018(15)00088-0. Duarte RF, Labopin M, Badoglio M, et al. Allogeneic transplantation in patients with HIV-infection: a pair matched cohort study by the European Society for Blood and Marrow Transplantation (Abstract 007). Bone Marrow Transplant. 2015;50(suppl 1):S5-S6. amfAR (Press Release). HIV cure research gains momentum from new amfAR funding. 2014 July 9. AVAC, IAS Towards an HIV Cure Initiative, HIV Vaccines and Microbicides Resource Tracking Working Group. Global investment in HIV cure research and development in 2013. 2014 July. amfAR (Press Release). amfAR announces $100 million investment strategy aimed at curing HIV. 2015 February 19. Walensky RP, Auerbach JD; Office of AIDS Research Advisory Council (OARAC) HIV/AIDS Research Portfolio Review Working Group. Focusing National Institutes of Health HIV/AIDS research for maximum population impact. Clin Infect Dis. 2015 Mar 15;60(6):937-40. doi: 10.1093/cid/ciu942. Lederman MM, Funderburg NT, Sekaly RP, Klatt NR, Hunt PW. Residual immune dysregulation syndrome in treated HIV infection. Adv Immunol. 2013;119:51-83. doi: 10.1016/B978-0-12-407707-2.00002-3. De Araújo AL, Silva LC, Fernandes JR, Benard G. Preventing or reversing immunosenescence: can exercise be an immunotherapy? Immunotherapy. 2013 Aug;5(8):879-93. doi: 10.2217/imt.13.77. National Institutes of Health (U.S.) (Press Release). NIH launches largest clinical trial focused on HIV-related cardiovascular disease. 2015 April 15. Funderburg NT, Jiang Y, Debanne SM, et al. Rosuvastatin reduces vascular inflammation and T-cell and monocyte activation in HIV-infected subjects on antiretroviral therapy. J Acquir Immune Defic Syndr. 2015 Apr 1;68(4):396-404. doi: 10.1097/QAI.0000000000000478. De Wit S, Delforge M, Necsoi CV, Clumeck N. Downregulation of CD38 activation markers by atorvastatin in HIV patients with undetectable viral load. AIDS. 2011 Jun 19;25(10):1332-3. doi: 10.1097/QAD.0b013e328347c083. ClinicalTrials.gov [Internet]. Bethesda (MD): National Library of Medicine (U.S.). 2000. Identifier NCT02344290, Evaluating the use of pitavastatin to reduce the risk of cardiovascular disease in HIV-infected adults (REPRIEVE); 2015 January 16 (cited 2015 April 27). Henrich TJ, Hanhauser E, Marty FM, et al. Antiretroviral-free HIV-1 remission and viral rebound after allogeneic stem cell transplantation: report of 2 cases. Ann Intern Med. 2014 Sep 2;161(5):319-27. doi: 10.7326/M14-1027. Hill AL, Rosenbloom DI, Fu F, Nowak MA, Siliciano RF. Predicting the outcomes of treatment to eradicate the latent reservoir for HIV-1.Proc Natl Acad Sci U S A. 2014 Sep 16;111(37):13475-80. doi: 10.1073/pnas.1406663111. Erratum in: Proc Natl Acad Sci U S A. 2014 Oct 28;111(43):15598. Rouzioux C, Hocqueloux L, Sáez-Cirión A. Posttreatment controllers: what do they tell us? Curr Opin HIV AIDS. 2015 Jan;10(1):29-34. doi: 10.1097/COH.0000000000000123. Lodi S, Meyer L, Kelleher AD, et al. Immunovirologic control 24 months after interruption of antiretroviral therapy initiated close to HIV seroconversion. Arch Intern Med. 2012 Sep 10;172(16):1252-5. doi: 10.1001/archinternmed.2012.2719. Van Lunzen J, Schulze zur Wiesch J, Schuhmacher U, Hauber I, Hauber J. Functional cure after long term HAART initiated during early HIV infection: a comprehensive case study (Abstract TUPE246). 7th IAS Conference on HIV Pathogenesis, Treatment and Prevention; 2013 June 20-July 3; Kuala Lumpur, Malaysia. Kinloch S, Dorrell L, Yang H, et al. Aviremia 10-year post-ART discontinuation initiated at seroconversion (Abstract 377). 22nd CROI; 2015 February 23-26; Seattle, WA. Van Gulck E, Bracke L, Heyndrickx L, et al. Immune and viral correlates of “secondary viral control” after treatment interruption in chronically HIV-1 infected patients. PLoS One. 2012;7(5):e37792. doi: 10.1371/journal.pone.0037792. Feeney ME, Tang Y, Rathod A, Kneut C, McIntosh K. Absence of detectable viremia in a perinatally HIV-1-infected teenager after discontinuation of antiretroviral therapy. J Allergy Clin Immunol. 2006 Aug;118(2):324-30. Uruena A, Mangano A, Arduino R, Aulicino P, Cassetti I. Functional cure and seroreversion after advanced HIV disease following 7-years of antiretroviral treatment interruption (Abstract MOPE016). AIDS 2014. 20th International AIDS Conference; 2014 July 20-25; Melbourne, Australia. Li JZ, Heisey A, Ahmed H, Wang H, et al. Relationship of HIV reservoir characteristics with immune status and viral rebound kinetics in an HIV therapeutic vaccine study. AIDS. 2014 Nov 28;28(18):2649-57. doi: 10.1097/QAD.0000000000000478. Hunt PW, Brenchley J, Sinclair E, et al. Relationship between T cell activation and CD4+ T cell count in HIV-seropositive individuals with undetectable plasma HIV RNA levels in the absence of therapy. J Infect Dis. 2008 Jan 1;197(1):126-33. doi: 10.1086/524143. Crowell TA, Gebo KA, Blankson JN, et al. Hospitalization rates and reasons among HIV elite controllers and persons with medically controlled HIV infection. J Infect Dis. 2015 Jun 1;211(11):1692-702. doi: 10.1093/infdis/jiu809. Epub 2014 Dec 15. Karris MY, Haubrich RH. Antiretroviral therapy in the elite controller: justified or premature? J Infect Dis. 2015 Jun 1;211(11):1689-91. doi: 10.1093/infdis/jiu812. Epub 2014 Dec 15. Rasmussen TA, Tolstrup M, Brinkmann CR, et al. Panobinostat, a histone deacetylase inhibitor, for latent-virus reactivation in HIV-infected patients on suppressive antiretroviral therapy: a phase 1/2, single group, clinical trial. Lancet HIV. 2014 Oct 1;1(1): e13-e21. Barton K, Hiener B, Palmer S, et al. Panobinostat broadly activates latent HIV-1 proviruses in patients (Abstract 109). 22nd CROI; 2015 February 23-26; Seattle, WA. http://www.croiwebcasts.org/console/player/25706?mediaType=audio&. Shan L, Deng K, Shroff NS, et al. Stimulation of HIV-1-specific cytolytic T lymphocytes facilitates elimination of latent viral reservoir after virus reactivation. Immunity. 2012 Mar 23;36(3):491-501. doi: 10.1016/j.immuni.2012.01.014. Tolstrup M, Vigano S, Olesen R, et al. Immunological correlates of HIV-1 DNA decline during latency reversal with panobinostat in patients on suppressive cART (Abstract LBPE06). 20th International AIDS Conference; 2014 July 20-25; Melbourne, Australia. Høgh Kølbæk Kjær AS, Brinkmann CR, et al. The histone deacetylase inhibitor panobinostat lowers biomarkers of cardiovascular risk and inflammation in HIV patients. AIDS. 2015 Jun 19;29(10):1195-200. doi: 10.1097/QAD.0000000000000678. Søgaard OS, Graversen ME, Leth S, et al. The HDAC inhibitor romidepsin is safe and effectively reverses HIV-1 latency in vivo as measured by standard clinical assays (Abstract TUAA0106LB). 20th International AIDS Conference; 2014 July 20-25; Melbourne, Australia. Olesen R, Rasmussen T, Graversen M, et al. In vivo effects of panobinostat and romidepsin on HIV-1-specific CD8 T cell immunity (Abstract 369). 22nd CROI; 2015 February 23-26; Seattle, WA. Argos Therapeutics (Press Release). NIH funds study of fully personalized immunotherapy AGS-004 combined with a latency reversing therapy for the treatment of HIV. 2015 April 1. Xing S, Bullen CK, Shroff NS, et al. Disulfiram reactivates latent HIV-1 in a Bcl-2-transduced primary CD4+ T cell model without inducing global T cell activation. J Virol. 2011 Jun;85(12):6060-4. doi: 10.1128/JVI.02033-10. Spivak AM, Andrade A, Eisele E, et al. A pilot study assessing the safety and latency-reversing activity of disulfiram in HIV-1-infected adults on antiretroviral therapy. Clin Infect Dis. 2014 Mar;58(6):883-90. doi: 10.1093/cid/cit813. Elliott JH, Lewin S, Deeks SG. Short-term disulfiram to reverse latent HIV infection (Abstract 0301). Keystone Symposia: Mechanisms of HIV Persistence: Implications for a Cure; 2015 April 26-May 1; Boston, MA. Mothe B, Climent N, Plana M, et al. Safety and immunogenicity of a modified vaccinia Ankara-based HIV-1 vaccine (MVA-B) in HIV-1-infected patients alone or in combination with a drug to reactivate latent HIV-1. J Antimicrob Chemother. 2015 Jun;70(6):1833-42. doi: 10.1093/jac/dkv046. Schlaepfer E, Speck RF. TLR8 activates HIV from latently infected cells of myeloid-monocytic origin directly via the MAPK pathway and from latently infected CD4+ T cells indirectly via TNF-α. J Immunol. 2011 Apr 1;186(7):4314-24. doi: 10.4049/jimmunol.1003174. Whitney J, Lim SY, Osuna C, et al. Treatment with a TLR7 agonist induces transient viremia in SIV-infected ART-suppressed monkeys (Abstract 108). 22nd CROI; 2015 February 23-26; Seattle, WA. Sloan D, Irrinki A, Tsai A, et al. TLR7 agonist GS-9620 activates HIV-1 in PBMCs from HIV-infected patients on cART (Abstract 417). 22nd CROI; 2015 February 23-26; Seattle, WA. Vandergeeten C, Da Fonseca S, Sereti I, Lederman M, Sekaly RP, Chomont N. Differential impact of IL-7 and IL-15 on HIV reservoir persistence (Abstract MOAA0101). 6th IAS Conference on HIV Pathogenesis, Treatment and Prevention; 2011 July 17-20; Rome, Italy. Steel JC, Waldmann TA, Morris JC. Interleukin-15 biology and its therapeutic implications in cancer. Trends Pharmacol Sci. 2012 Jan;33(1):35-41. doi: 10.1016/j.tips.2011.09.004. Seay K, Church C, Zheng JH, et al. In vivo activation of human NK cells by treatment with an interleukin-15 superagonist potently inhibits acute in vivo HIV-1 infection in humanized mice. J Virol. 2015 Jun 15;89(12):6264-74. doi: 10.1128/JVI.00563-15. Epub 2015 Apr 1. Jones RB, Mueller S, O’Connor R, et al. Cytotoxic T-lymphocytes in combination with the IL-15 superagonist ALT-803 eliminate latently HIV-infected autologous CD4+ T-cells from natural reservoirs (Abstract 2008). Keystone Symposia: Mechanisms of HIV Persistence: Implications for a Cure; 2015 April 26-May 1; Boston, MA. Spina CA, Anderson J, Archin NM, et al. An in-depth comparison of latent HIV-1 reactivation in multiple cell model systems and resting CD4+ T cells from aviremic patients. PLoS Pathog. 2013;9(12):e1003834. doi: 10.1371/journal.ppat.1003834. Pérez M, de Vinuesa AG, Sanchez-Duffhues G, et al. Bryostatin-1 synergizes with histone deacetylase inhibitors to reactivate HIV-1 from latency. Curr HIV Res. 2010 Sep;8(6):418-29. Laird GM, Bullen CK, Rosenbloom DI, et al. Ex vivo analysis identifies effective HIV-1 latency-reversing drug combinations. J Clin Invest. 2015 May 1;125(5):1901-12. doi: 10.1172/JCI80142. Ariza ME, Ramakrishnan R, Singh NP, Chauhan A, Nagarkatti PS, Nagarkatti M. Bryostatin-1, a naturally occurring antineoplastic agent, acts as a Toll-like receptor 4 (TLR-4) ligand and induces unique cytokines and chemokines in dendritic cells. J Biol Chem. 2011 Jan 7;286(1):24-34. doi: 10.1074/jbc.M110.135921. Morgan RJ Jr, Leong L, Chow W, et al. Phase II trial of bryostatin-1 in combination with cisplatin in patients with recurrent or persistent epithelial ovarian cancer: a California cancer consortium study. Invest New Drugs. 2012 Apr;30(2):723-8. doi: 10.1007/s10637-010-9557-5. Jiang G, Mendes EA, Kaiser P, et al. Reactivation of HIV latency by a newly modified Ingenol derivative via protein kinase Cδ-NF-κB signaling. AIDS. 2014 Jul 17;28(11):1555-66. doi: 10.1097/QAD.0000000000000289. Pandeló José D, Bartholomeeusen K, da Cunha RD, et al. Reactivation of latent HIV-1 by new semi-synthetic ingenol esters. Virology. 2014 Aug;462-463:328-39. doi: 10.1016/j.virol.2014.05.033. Scheid JF, Mouquet H, Feldhahn N, et al. Broad diversity of neutralizing antibodies isolated from memory B cells in HIV-infected individuals. Nature. 2009 Apr 2;458(7238):636-40. doi: 10.1038/nature07930. Epub 2009 Mar 15. Simek MD, Rida W, Priddy FH, et al. Human immunodeficiency virus type 1 elite neutralizers: individuals with broad and potent neutralizing activity identified by using a high-throughput neutralization assay together with an analytical selection algorithm. J Virol. 2009 Jul;83(14):7337-48. doi: 10.1128/JVI.00110-09. Wu X, Yang ZY, Li Y, et al. Rational design of envelope identifies broadly neutralizing human monoclonal antibodies to HIV-1. Science. 2010 Aug 13;329(5993):856-61. doi: 10.1126/science.1187659. Halper-Stromberg A, Lu CL, Klein F, et al. Broadly neutralizing antibodies and viral inducers decrease rebound from HIV-1 latent reservoirs in humanized mice. Cell. 2014 Aug 28;158(5):989-99. doi: 10.1016/j.cell.2014.07.043. Epub 2014 Aug 14. Caskey M, Klein F, Lorenzi JC, et al. Viraemia suppressed in HIV-1-infected humans by broadly neutralizing antibody 3BNC117. Nature. 2015 Jun 25;522(7557):487-91. doi: 10.1038/nature14411. Graham BS. Update on clinical development of VRC01 and second generation neutralizing CD4 binding site-specific monoclonal antibodies (Abstract SY12.01). HIV Research for Prevention Conference; 2014 October 28-31; Cape Town, South Africa. Bolton D, Robb M, Michael N, et al. Efficacy of HIV-1 monoclonal antibody immunotherapy in acute SHIV-infected macaques (Abstract 50). 22nd CROI; 2015 February 23-26; Seattle, WA. Barouch DH, Whitney JB, Moldt B, et al. Therapeutic efficacy of potent neutralizing HIV-1-specific monoclonal antibodies in SHIV-infected rhesus monkeys. Nature. 2013 Nov 14;503(7475):224-8. doi: 10.1038/nature12744. Barouch D. Broadly neutralizing antibodies for HIV-1 eradication strategies (Abstract 67). 22nd CROI; 2015 February 23-26; Seattle, WA. Lam S, Sung J, Cruz C, et al. Broadly-specific cytotoxic T cells targeting multiple HIV antigens are expanded from HIV+ patients: implications for immunotherapy. Mol Ther. 2015 Feb;23(2):387-95. doi: 10.1038/mt.2014.207. Epub 2014 Nov 4. Stock PG1, Barin B, Hatano H, et al. Reduction of HIV persistence following transplantation in HIV-infected kidney transplant recipients. Am J Transplant. 2014 May;14(5):1136-41. doi: 10.1111/ajt.12699. Dovey D. FDA gives HIV ‘functional cure’ go-ahead for human trials [Internet]. Medical Daily. 2015 March 10. Leuty R. Study of potential HIV ‘cure’ wins FDA nod [Internet]. San Francisco Business Times. 2015 March 3. Mitsuyasu RT, Merigan TC, Carr A, et al. Phase 2 gene therapy trial of an anti-HIV ribozyme in autologous CD34+ cells. Nat Med. 2009 Mar;15(3):285-92. doi: 10.1038/nm.1932. Tebas P, Stein D, Tang WW, et al. Gene editing of CCR5 in autologous CD4 T cells of persons infected with HIV. N Engl J Med. 2014 Mar 6;370(10):901-10. doi: 10.1056/NEJMoa1300662. Blick G, Lalezari J, Hsu R, et al. Cyclophosphamide enhances SB-728-T engraftment to levels associated with HIV-RNA control (Abstract 141). 21st CROI; 2014 March 3-6; Boston, MA. IDIBAPS (Press Release). EU Grants a project to test an innovative HIV vaccine candidate in two phase I/IIa clinical trials. 2013 December 9. Cohen J. AIDS research. Feud over AIDS vaccine trials leads prominent Italian researchers to court. Science. 2007 Aug 10:317(5839):738-9. doi: 10.1126/science.317.5839.738. Robinson HL, Thompson M, Heath S, et al. Elicitation of immune responses by a DNA/MVA vaccine in ART treated patients in a treatment interruption trial (Abstract OA05.03). HIV Research for Prevention Conference; 2014 October 28-31; Cape Town, South Africa. Estes JD, Reilly C, Trubey CM, et al. Antifibrotic therapy in simian immunodeficiency virus infection preserves CD4+ T-cell populations and improves immune reconstitution with antiretroviral therapy. J Infect Dis. 2015 Mar 1;211(5):744-54. doi: 10.1093/infdis/jiu519. Epub 2014 Sep 22. ClinicalTrials.gov [Internet]. Bethesda (MD): National Library of Medicine (U.S.). 2000. Identifier NCT01852942, Reversing tissue fibrosis to improve immune reconstitution in HIV; 2012 February 20 (cited 2015 June 7). Zhang Z, Fu J, Xu X, et al. Safety and immunological responses to human mesenchymal stem cell therapy in difficult-to-treat HIV-1-infected patients. AIDS. 2013 May 15;27(8):1283-93. doi: 10.1097/QAD.0b013e32835fab77. ClinicalTrials.gov [Internet]. Bethesda (MD): National Library of Medicine (U.S.). 2000. Identifier NCT02290041, Treatment with MSC in HIV-infected patients with controlled viremia and immunological discordant response. 2014 November 10 (cited 2015 June 7). Li T, Xie J, Li Y, Routy JP, et al. Tripterygium wilfordii Hook F extract in cART-treated HIV patients with poor immune response: a pilot study to assess its immunomodulatory effects and safety. HIV Clin Trials. 2015 Mar-Apr;16(2):49-56. doi: 10.1179/1528433614Z.0000000005. Epub 2015 Jan 26. ClinicalTrials.gov [Internet]. Bethesda (MD): National Library of Medicine (U.S.). 2000. Identifier NCT02394730, Attenuation of D-dimer using vorapaxar to target inflammatory and coagulation endpoints (ADVICE); 2015 March 16 (cited 2015 June 7). Tebas P, Spitsin S, Barrett JS, et al. Reduction of soluble CD163, substance P, programmed death 1 and inflammatory markers: phase 1B trial of aprepitant in HIV-1-infected adults. AIDS. 2015 May 15;29(8):931-9. doi: 10.1097/QAD.0000000000000638. ClinicalTrials.gov [Internet]. Bethesda (MD): National Library of Medicine (U.S.). 2000. Identifier NCT02154360, Pharmacokinetic characteristics and anti-inflammatory effects of aprepitant in HIV-infected subjects (Emend-IV); 2014 May 22 (cited 2015 June 7). Villar-García J, Hernández JJ, Güerri-Fernández R, et al. Effect of probiotics (Saccharomyces boulardii) on microbial translocation and inflammation in HIV-treated patients: a double-blind, randomized, placebo-controlled trial. J Acquir Immune Defic Syndr. 2015 Mar 1;68(3):256-63. doi: 10.1097/QAI.0000000000000468. French MA, Cozzi-Lepri A, Arduino RC, Johnson M, Achhra AC, Landay A; INSIGHT SMART Study Group. Plasma levels of cytokines and chemokines and the risk of mortality in HIV-infected individuals: a case-control analysis nested in a large clinical trial. AIDS. 2015 Apr 24;29(7):847-51. doi: 10.1097/QAD.0000000000000618. ClinicalTrials.gov [Internet]. Bethesda (MD): National Library of Medicine (U.S.). 2000. Identifier NCT02441244, Probiotic VSL#3 for inflammation and translocation in HIV I (PROOV IT I); 2015 April 23 (cited 2015 June 7). ClinicalTrials.gov [Internet]. Bethesda (MD): National Library of Medicine (U.S.). 2000. Identifier NCT02441231, Probiotic VSL#3 for inflammation and translocation in HIV II (PROOV IT II); 2015 April 23 (cited 2015 June 7). Routy JP, Angel JB, Patel M, et al. Assessment of chloroquine as a modulator of immune activation to improve CD4 recovery in immune nonresponding HIV-infected patients receiving antiretroviral therapy. HIV Med. 2015 Jan;16(1):48-56. doi: 10.1111/hiv.12171. ClinicalTrials.gov [Internet]. Bethesda (MD): National Library of Medicine (U.S.). 2000. Identifier NCT00819390, Chloroquine for reducing immune activation in HIV-infected individuals; 2009 January 8 (cited 2015 June 7).